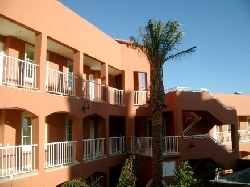 Playa Paraiso Residencial is a lovely apartment complex built to very high standards situated on an elevated position just outside the tranquil town of Costa Calma in the south of Fuerteventura. 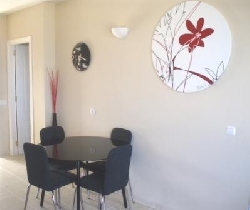 Our apartment is on the top floor of this lovely development with spectacular, panoramic views over the town, Atlantic Ocean & mountains in the distance. Access to the glorious white sands of Sotavento de Jandia, one of the most beautiful stretches of beach in Europe (22 kms long; from Costa Calma to Morro Jable), takes approximately 7 minutes downhill by foot. Our apartment overlooks the turquoise waters of Playa Esmeralda, perfect for bathing and Playa La Barca; a world renowned Kiteboarding & Windsurfing beach, where, 3 weeks of the year, during July & August, rounds of the PWA Windsurfing & PKRA Kiteboarding Championships are held. Bedroom 1: Double bed with fitted wardrobes, dressing table and french doors leading to the balcony. Open Plan Lounge: with corner sofa which converts to large sofabed (comfortably sleeps 2 adults), leather easy chair & footstool, dining table & 4 chairs. Picture window with stunning views!! Kitchen: Fully-equipped with breakfast bar. Balcony: with table & chairs. Roof Terraces: Access to 2 roof terraces, one enormous one to the side of the apartment & one, more private, above the apartment. 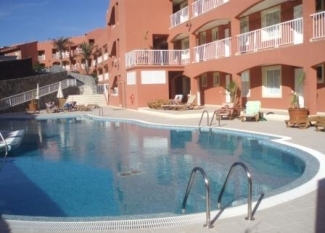 Pool: Large communal (unheated) pool with plenty of sunloungers & parasols. WC & Showers and amazing views! The local area has numerous restaurants and bars plus a couple of small nightclubs. There are many 4* & 5* hotels offering entertainment, bar & spa facilities. 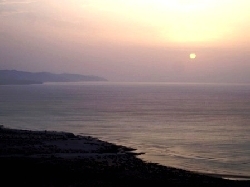 Jandia is a 15 minute drive where you'll have access to many more restaurants, bars and shops. As well as an 18-hole golf course. 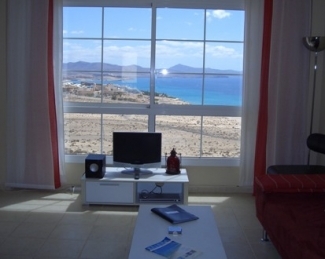 It is advisable to hire a car when coming to Fuerteventura. 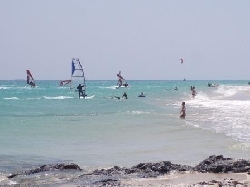 There is a regular bus service in Costa Calma which is very good but many of the best beaches are "off-road" and as such a car is the best way to discover the south. Car hire from the airport for 1 week is approximately �120, the best hire companies are: Cabrera Medina & Auto Reisin. A taxi from the airport, approx. 50 miles away, will be around �60 each way, so by hiring a car you will soon save money. The roads are excellent with a new road having been built from North to South only a few years ago and the link between Costa Calma and Jandia being finished this year.